This July, I will be riding in an event called RAGBRAI (Register’s Annual Bike Ride Across Iowa), and participating in this event is a dream that has been 20 years in the making. In 1992, the route for RAGBRAI ended in Keokuk, Iowa, and my grandparents’ restaurant along Mississippi River Road was the last rest and water stop before the cyclists completed the week-long event. Thousands of cyclists rolled past the restaurant, and hundreds stopped. I was only 10 years old at the time, but I helped get water and lemonade and was able to hear many stories from cyclists who had ridden all the way from the Nebraska border that week. Riding across the state sounded like an amazing journey; one I would love to complete someday. Late this July, along with my husband, my friends Jeff and Jim, and 30 or other members of the Keokuk Bike Club, I will finally ride RAGBRAI. 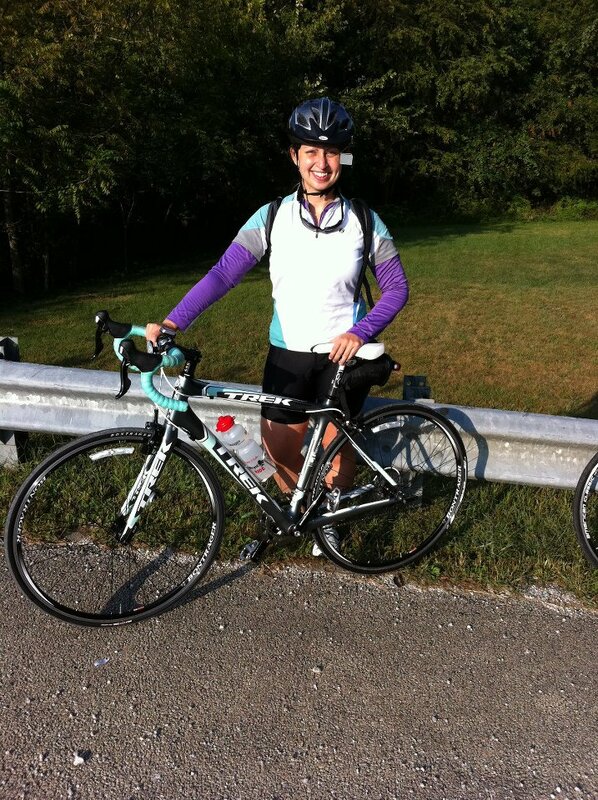 My bike and I at the Capital City Century- my longest ride of 2011. RAGBRAI is celebrating its 40thAnniversary this year, and according to its website, is the oldest, longest, and largest bicycle touring event in the world. The route changes every year, but it always begins with a tire dip in the Missouri River on the western border of Iowa, and ends with a tire dip in the Mississippi River on the eastern border of the state. There are 6 overnight towns each year. For 2012 they are Sioux Center, Cherokee, Lake View, Webster City, Marshalltown, Cedar Rapids, Anamosa and Clinton, Iowa. This year’s total RAGBRAI mileage will be 471 miles. There will be 8,500 week-long cyclists and an additional 1,500 day-pass riders. The event attracts people from all 50 states, many foreign countries, and generally includes a few celebrity cyclists like Lance Armstrong. In addition to the riders, there are also hundreds of people who participate as support staff for the event, and the economic impact this has on the state is incredible. 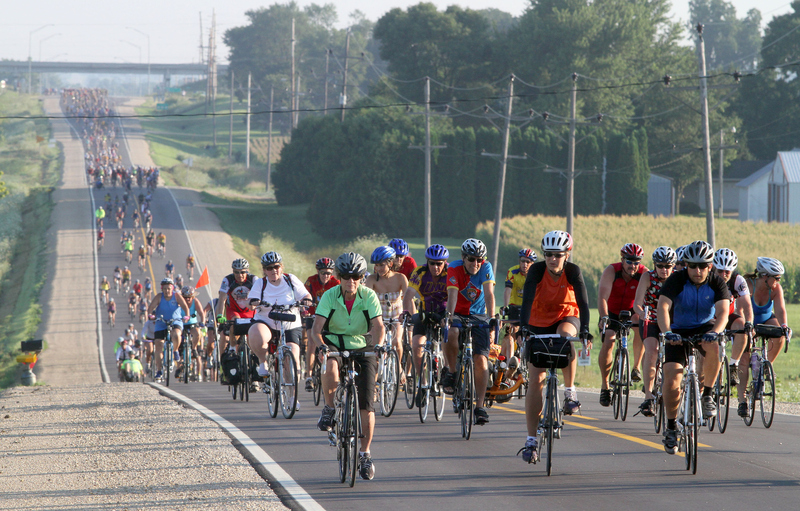 A recent study by the University of Northern Iowa estimated that the week-long event will contribute upwards of $17 million to the towns and cities along the route. Now, I know what you non-Iowans are thinking. You’re thinking that cycling 500 miles across Iowa shouldn’t be that hard because Iowa is so flat. Well I’ve got news for you: Kansas is flat. Iowa is not! Need proof? In 2011, the RAGBRAI route had a total of 21,206 feet of climb, and the same year, the Ride the Rockies route (across Colorado… which summits mountains every day) had 21,604 feet of total climb. Iowa hasn’t got any mountain ranges, but its topography is carved from ancient glaciers and is a roller coaster of steep hills, imposing limestone bluffs and deep river valleys. This year’s RAGBRAI route gives riders a “break” and only includes a little over 16K feet of climb, but it is certainly no cake-walk across the Hawkeye State. There is still time to sign up for RAGBRAI as an individual week long rider or a day-pass rider, but I wouldn’t wait long. Due to demand, RAGBRAI uses a lottery system to distribute passes, and you have to sign online prior to April 1 to be in the lottery. There may still be an opportunity to ride with an organized club if you do some checking online, however the Keokuk Club is full at this time. The deadline to register for day passes is June 1. Click here for the official RAGBRAI website. I’ll be blogging lots more about RAGBRAI between now and July, so stay tuned for more on my coast-to-coast trip across Iowa. 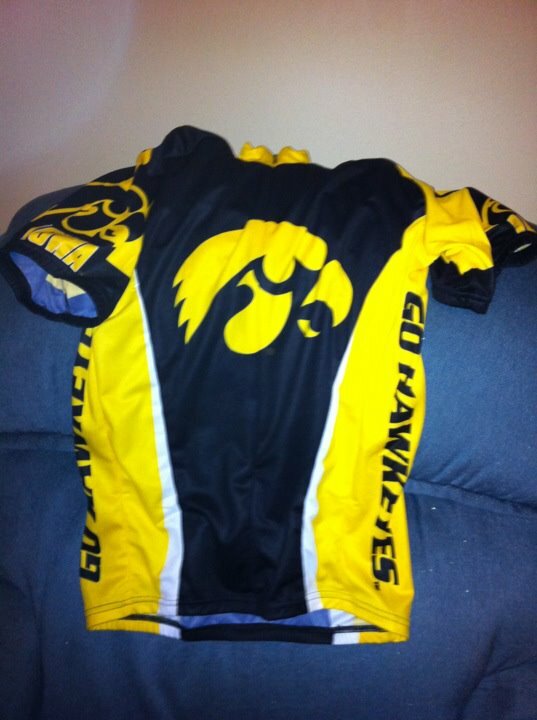 As always, it’s great to be a cyclist, and it’s great to be a HAWKEYE! *Note- an earlier version of this post incorrectly indicated that the last time the tour ended in Keokuk was 1994. It was actually 1992. I was 10 years old! Guess it makes my dream even more long-awaited! Thanks to Jim V. for catching the error!